Whether you plan on selling your home or staying put for years to come, a bathroom remodel is a great way to add value to your home. However, before you start picking out tile patterns, be sure to check with a bathroom remodeling contractor to determine what will be feasible for your home. In this blog post, we will go over the five things you’ll want to consider before making bathroom remodeling plans. 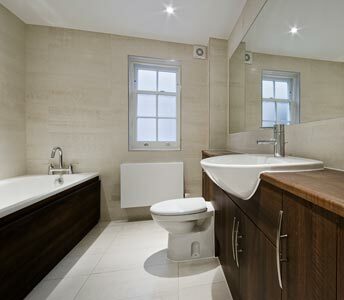 If you are adding an extra bathroom to your home simply to add value, you’ll want to create a full or three-quarter bathroom. According to The Nest, adding a bathroom with a shower or tub can increase the resale value of your home by about 20%. In comparison, a half bath only increases your home’s value by an average of 10.5%. In other words, the bigger the bathroom, the better your return on investment. If you don’t have enough space for a full or three-quarter bath, you can still add some value to your home through a half bath. Prospective homebuyers with families can definitely appreciate an extra bathroom. If you plan on staying in your home, a small bathroom remodel can give you just as many benefits if it is tailored to your lifestyle. Does the bathroom need to be completed by a certain date? This can be the case if you plan on having another family member living under your roof soon or you need to move by a certain date. If you are under a time crunch, you’ll need to talk with a Kalamazoo bathroom remodeler about what is going to be feasible to complete within your timeframe. Pinterest can be a great place to store all your bathroom remodeling ideas. Before contacting a bathroom remodeler, it’s important to have a specific vision in mind. Bathroom remodeling inspiration comes from looking at lots of different photos of what other homeowners have done with their bathrooms. Create a board with all your favorite inspiration to get a better idea of the style and aesthetic you want for your bathroom. How much money are you willing to spend for this remodeled bathroom? Keep in mind that you will need to pay for labor, materials, permits, and surprise expenses. Just in case your bathroom remodeling project has unforeseen complications, set aside extra money than what you think you’ll need. You’ll thank us later. Hire a bathroom remodeler for the stuff you can’t DIY. For example, painting your bathroom is something that can easily be done, unlike new shower installation. Use your best judgment and remember that a bathroom remodeling contractor will be able to do the job efficiently with professional results. The bathroom remodelers at Abode Building Center are dedicated to helping homeowners remodel bathrooms with professional results. If you are planning a bathroom remodel, give our Kalamazoo building contractors a call at (269) 329-1800.